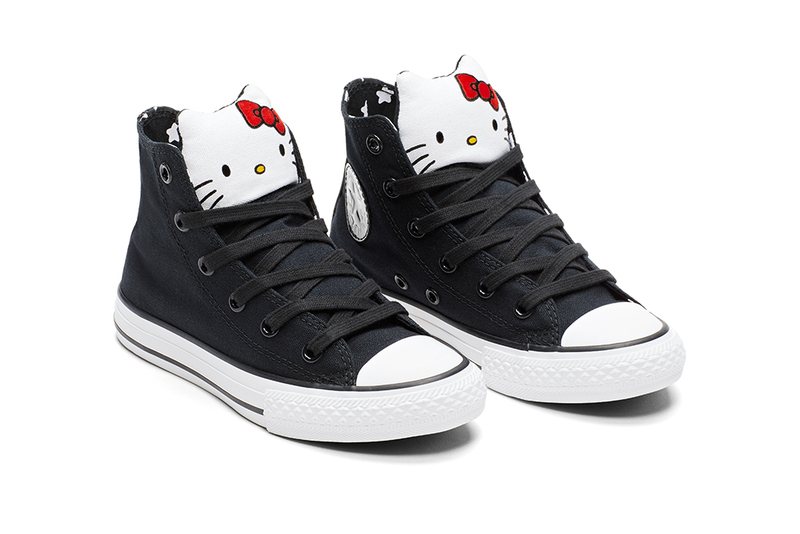 Hello Kitty is no stranger to Converse. 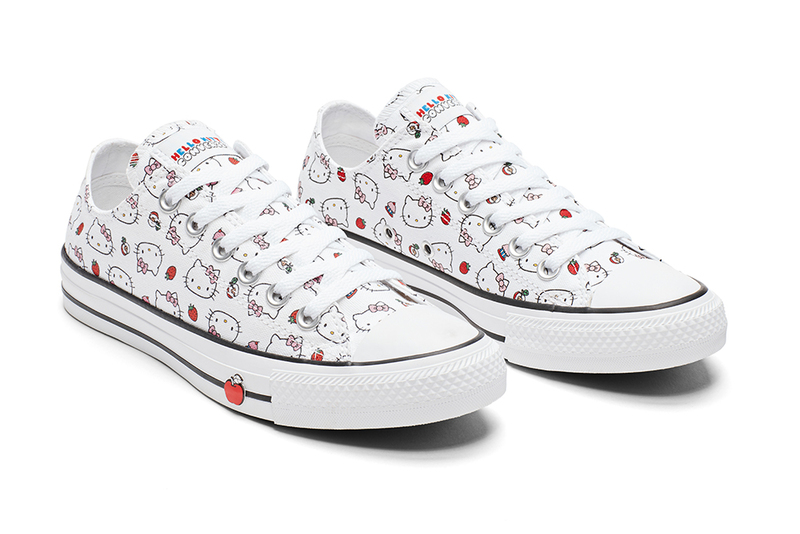 Just a couple months ago, the lovable cat (or girl) partnered up with the sneaker brand for a collection of six kicks featuring Hello Kitty, with her friends joining her for one design as well! And today, the next installment of the adorable collection is dropping! 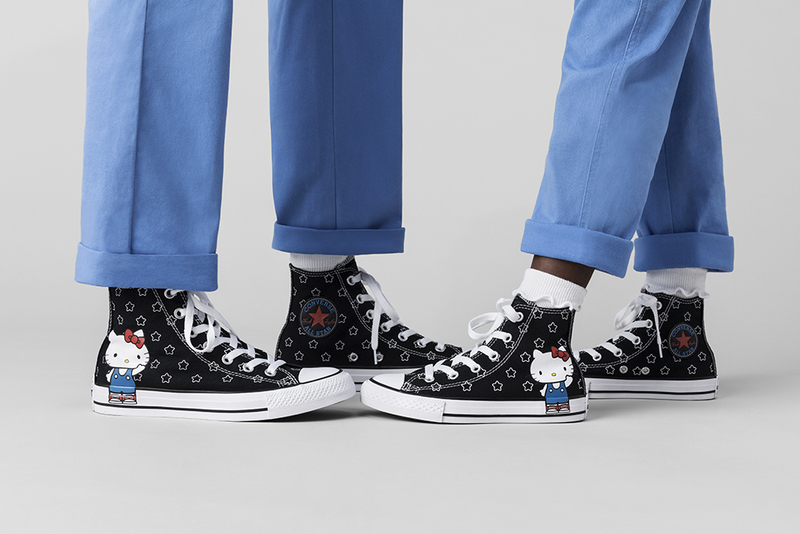 The classic Chuck Taylor and Ox silhouettes from Converse gets a Hello Kitty makeover in bold prints and striking colours. 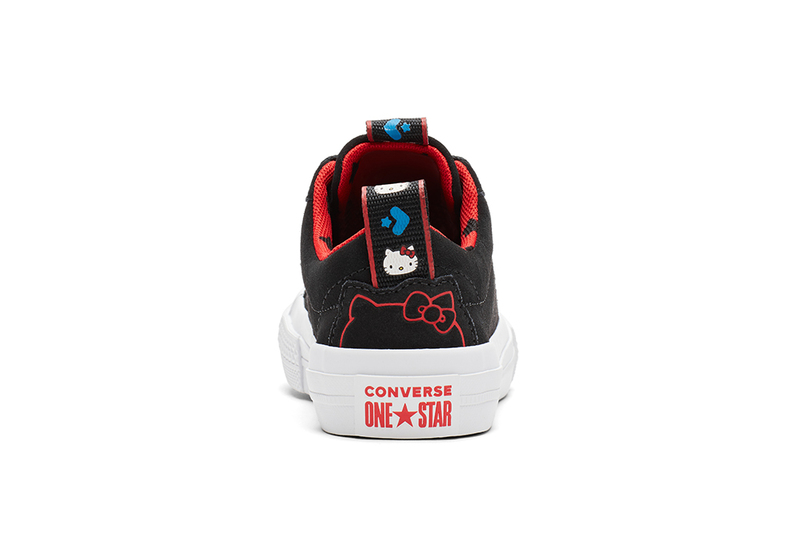 Whether you prefer high cuts or low cut, edgy kawaii or girly cute, this collaboration between Converse and Hello Kitty will look good on the streets and on kids. The sneakers are unisex, and come in both adults and kid sizes so you can coordinate with your partner or even your whole family! And we’re not judging any guys who sport a pair of these kicks cos they are just that irresistible. 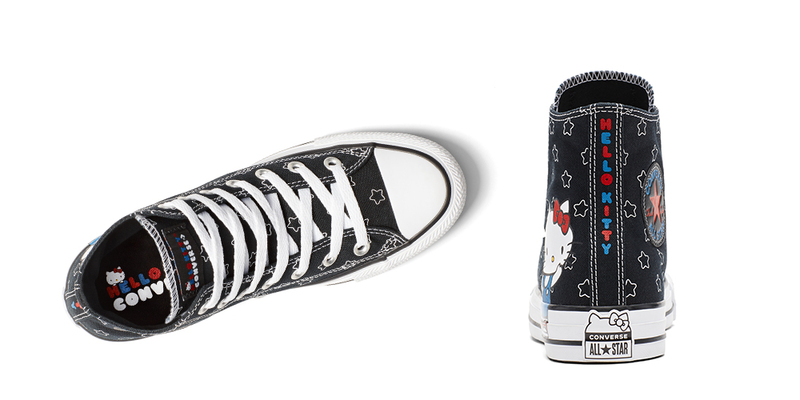 We’re going starry-eyed over the classic black Chuck Taylor, that has Hello Kitty waving to us from the side of the shoe. The sole and heel is also imprinted with both brands logos, and you’ll find a running strip down the back of the heel with the kitty’s name in bold red and blue. Equally girly and punk-ish! A loud shoe to match your loud personality! 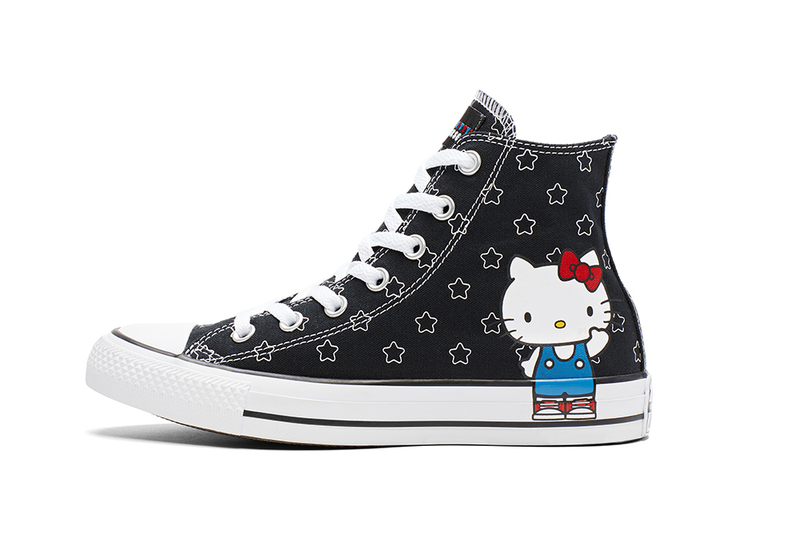 This rendition of the Chuck Taylor sees Hello Kitty cheekily peeking out from the tongue. The insides of the shoes is lined with that cute star print, with the same logos on the soles. Here’s one for the girly ones! This cute pair of low cut Chucks is covered in a Hello Kitty and strawberry print. Along the outer soles, there’s a little apple running along the foxing tape. 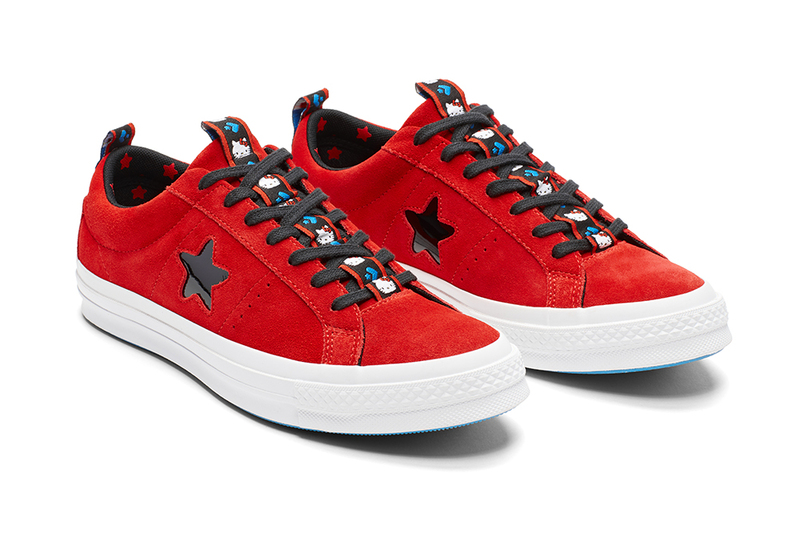 As if the One Star wasn’t bold enough, this colourway is a black shoe with a red star and inner lining. 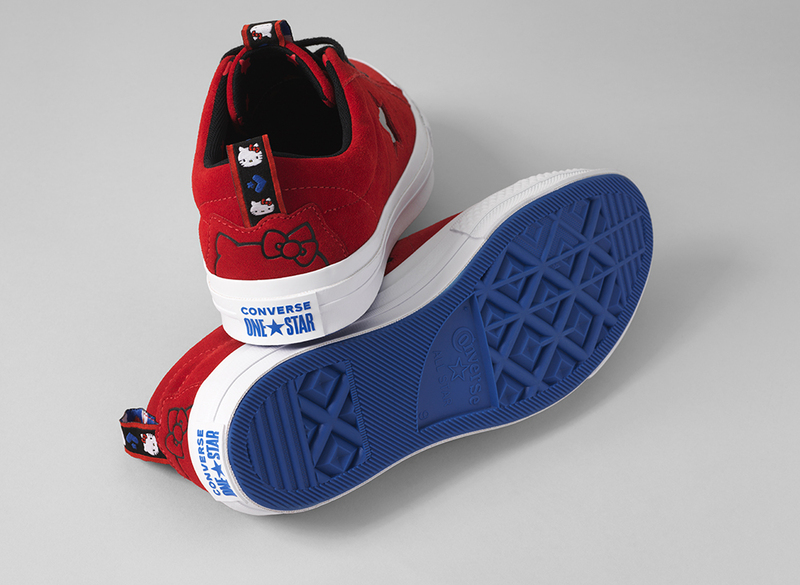 A series of alternating Converse logos and Hello Kitty faces run down the shoe tongue, criss-crossing with the shoelaces. Of course, there’s the starry inner lining, and the co-branded heel tag. Go out with a bang with the all over red One Star. It’s like the previous colourway but reversed. Immediately brighten up any outfit with this pair of kicks! The bright blue soles mean that you’ll leave behind a colourful trail too. 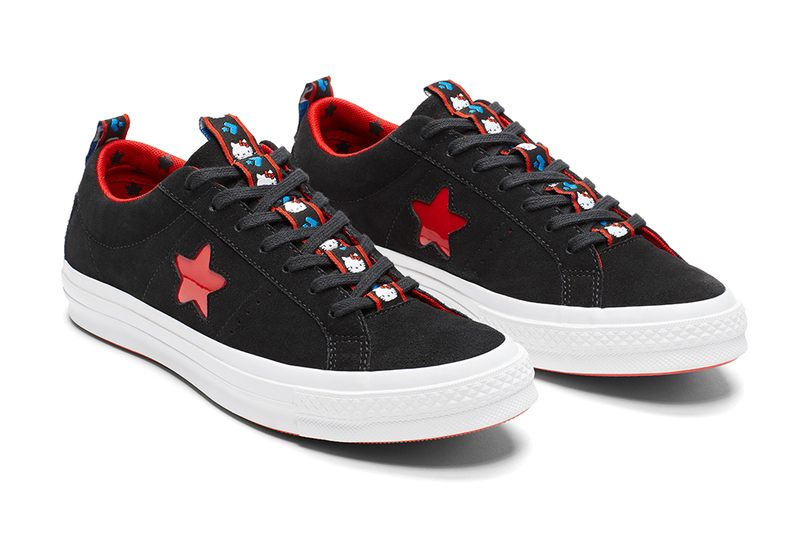 The full Converse x Hello Kitty collection is available at Converse ION and at Lazada. Selected styles available at Converse Ngee Ann City, Converse Tampines Mall, Zalora, and Limited Edition Vault.